Note: The source code for this tutorial is available in the tutorials/TutorialGame_Introduction/part3.ras (in the TRSE framework), together with all resources mentioned in these texts. 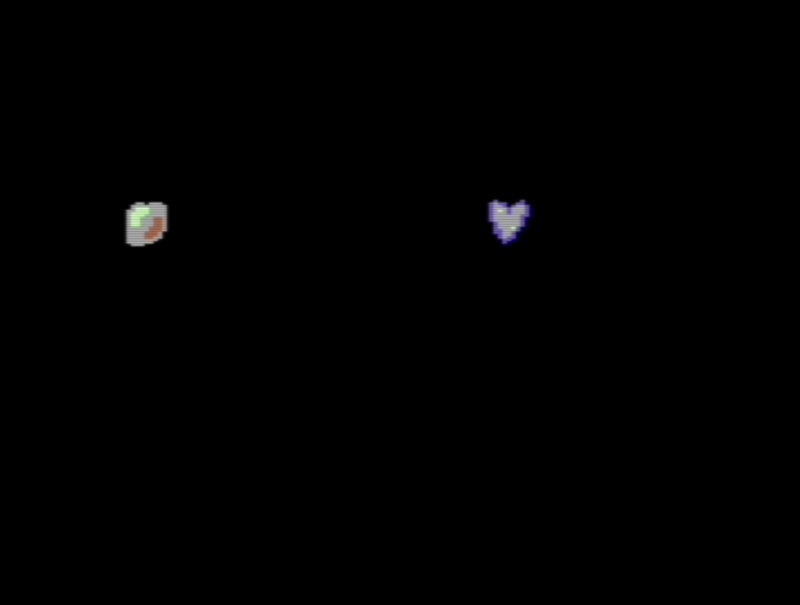 Sprites, or movable blocks (MOBs, a technical term that nobody used) are the main source of movable entities on the C64. Sprites are usually the backbone of any game, being rasterized indepedently from the background character data. The C64 supports 8 simultaneous sprites, but this limit can be extended by using some neat tricks like multiplexing. In your TRSE game tutorial project, press “New File->Image/Charset/Sprite” and select Sprite. 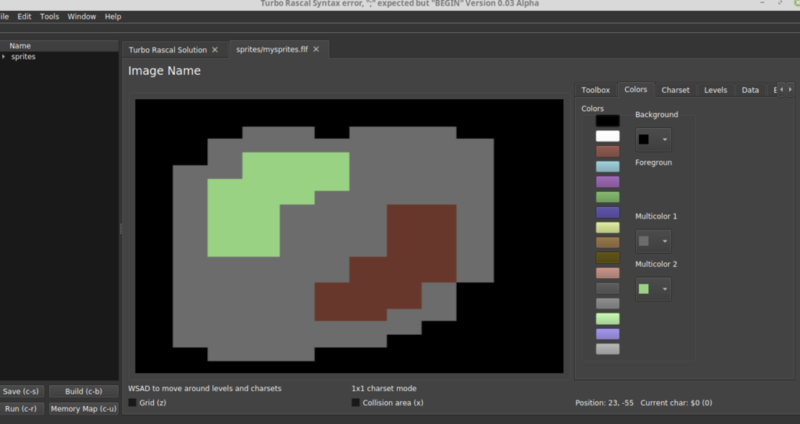 For now, TRSE only supports multicolor sprites (verson 0.04 will support regular sprites as well). After having created the file, save it in a directory called “sprites” within the project folder. f you press the “Charset” tab, you’ll be presented with a selectable view of all your sprites in the current file. You can also switch between sprites by pressing the left/right arrow. Finally, export your sprite by clicking the toolbox tab selecting the “Export bin” button. Save the file as “sprites/sprites.bin”. Here, we set bakcground and border color to black, and clear the screen (fill the screen area at $0400 with 40*25 bytes of value $20, which is clear space). Finally, the program just loops endlessly. Let’s include and initialize our sprites! We included the binary file at memory address $3200. Since the sprite locations are divided into 64 byte chunks, in order to find the first sprite we need to divide $3200 / 64 = $C8. The next sprites will be located at $C9, $CA etc. SetSpriteLoc sets sprite from parameter 1 at location parameter 2 on bank parameter 3. For now, we stick to bank 0. 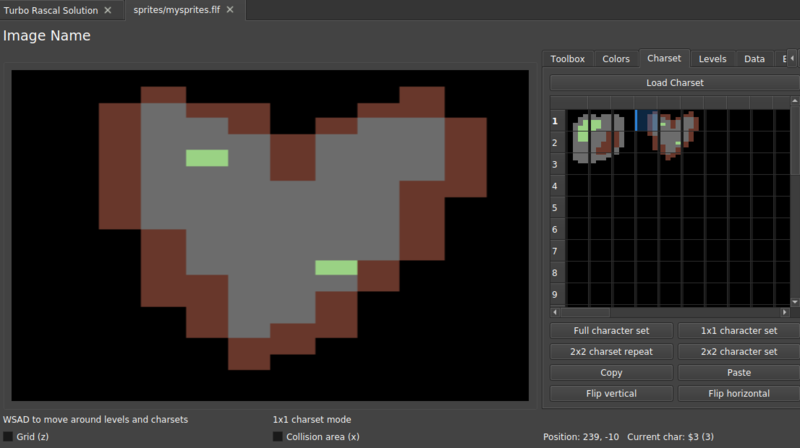 SpritePos sets the x and y coordinates of the sprite from parameter 3. Note that the first value can either be a 0-255 constant or an integer for values >255<320.  We set SPRITE_BITMASK to enable sprite 0 and 1 by toggling the first two bits. and that’s it! Tutorial part 3 done!